I’m sure you love Fall colors to decorate your home, mini quilts are easy to make and great for Fall decoration! There’s nothing like go back home every day after a long day at work or school and see a cozy home waiting for you. 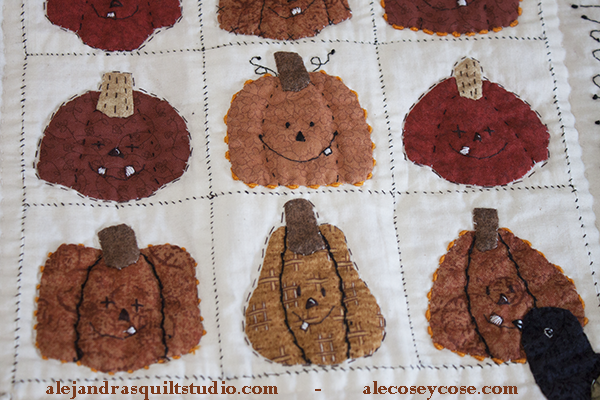 I love to make mini quilts with pumpkins ! must the be color of the fabrics and to tell you the true, I think I’m a big fan of yellow, oranges, greens, and browns. If you need some fabrics with the perfect colors for this season, you can take a look on amazon.com to find the right fabric for your next project. Today, I would like to share with you some of my Fall mini quilt collection I have made, I use to make one or two new mini quilts each year, sometimes one will be for this time of the year. Hmmm, hard to set my mind on it, this year has been a tough year on the weather here, a long and hard period of rain and fresh weather, no Spring weather and Summer has been a terrible season with only two sunny Sundays!, which takes us to just thinking on Fall! One thing I’m sure, quilts are also great to help us to keep our homes like homes. I know, there’re some houses that are decorate so beautiful and so new, but that is not my style, I prefer a house when every day or year, you make something new with your own hands to decorate it. To decorate a house might take a few years if not more to call the job done! 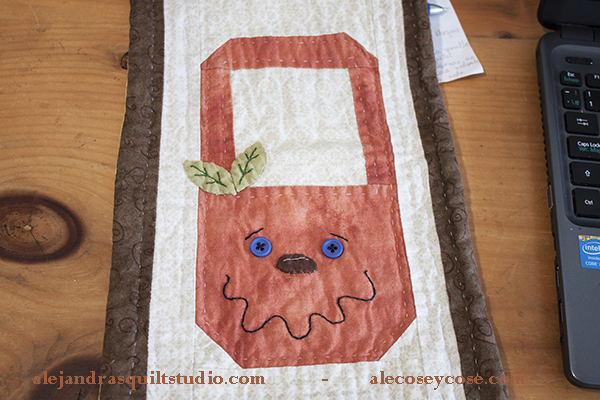 And who wants to stop making quilts with so many great ideas quilters share now on their blogs!! 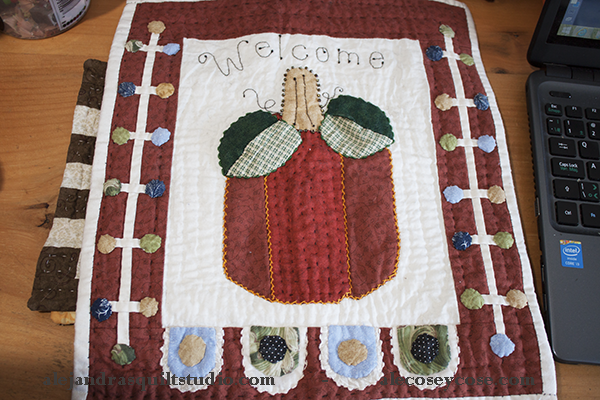 I’m sure you also love to visit those blogs where you get new ideas for your own quilts. 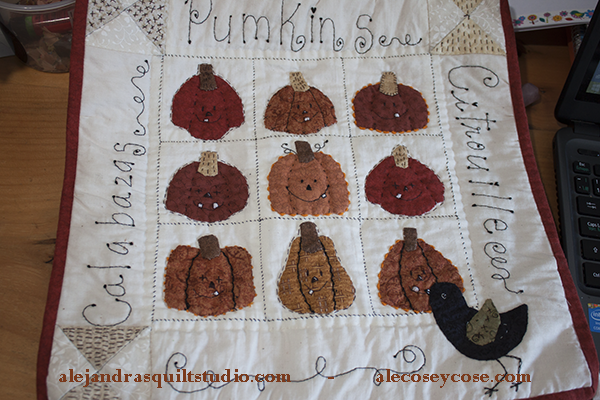 Fall ideas to make a quilt are unlimited, but my favorites are pumpkins! big, medium and small, happy with big smiles on them. You don’t need lots of materials to make a new mini quilt, and it won’t take you long to finish it, in about one or two hours you can make one, that is a good reason to make a mini quilt. What do you need to make a mini quilt? Some cotton fabrics, on this case, you don’t need large pieces, mini quilts are perfect for those beautiful little pieces you’re keeping for something pretty to make. Some quilting thread, in white or beige and some in other colors like orange, brown or green. A pattern or two. Well this time I don’t have a free pattern for you, as the mini quilts I have for Fall I made them a few years ago, and at that time I didn’t kept the patterns, sorry. How do you make a mini quilt? Once you get all the materials ready, and you have decided the pattern you will be working with, follow the pattern you got. In case you don’t have any pattern and you might want to make your own mini quilt based on one of my mini quilts here, well here’s an idea of what you can do. Draw on a paper the pattern you will be working, let’s say one of the small Pumpkins, then cut it out from the paper and place it on the fabric, mark it down with a pencil and remember to cut 1/4 ” bigger, once you got all the pumpkins cut on fabric, you can place them on the top of your mini quilt and run a big stitch or two to hold them on its place, you can do this step placing a pin on each one. Work on the applique of each pumpkin and once you finish this step, then you can add some embroidery on each pumpkin, eyes, nose and mouth, one tooth or two with be enough. This might be the time you have your mini quilt top finished, iron it lightly and place it on the batting fabric and place a fabric for the back, it’s time to work on the quilting. Hand made or machine made will be perfect, you can decide which one will work great for your mini quilt. 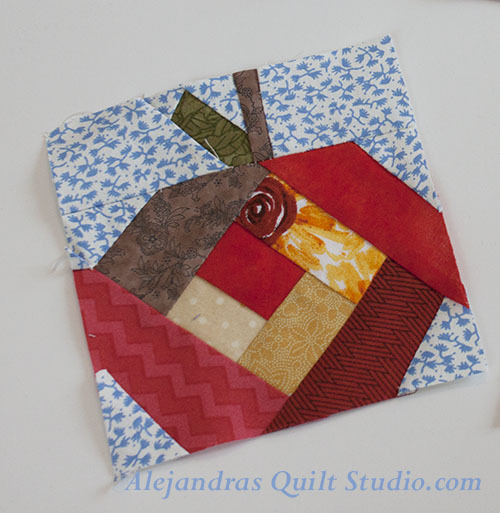 Once it’s done, then finish it, self binding is a great idea to finish a mini quilt. 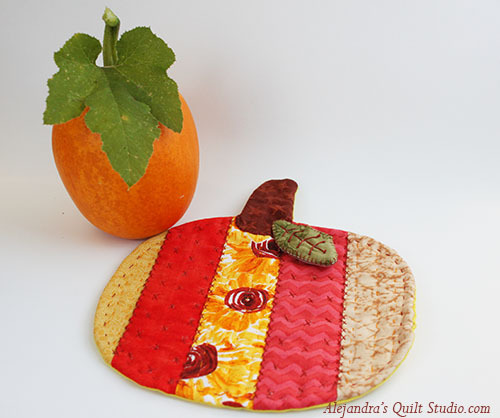 You can follow this link to read a tutorial I made for you to make a pumpkin mini quilt, it will give you a better idea about how you can make one. But if you’re looking to make something really small, why not to make my Pumpkin Paper Piecing pattern for this 5 x 5 ” block. I’m sure you will get some great ideas to make with it, a real small mini quilt to hang it on a wall, maybe a mug rug or what about a pot holder. I would love to hear from you, do you like to decorate your home for Fall? write a comment. 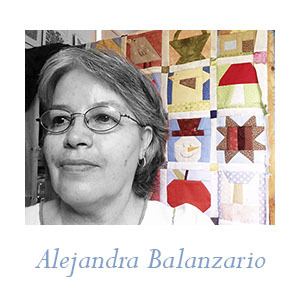 If you want to follow me on Facebook you can give me a LIKE on my Facebook fans page Alejandra’s Quilt Studio to be the first one to get my newest free pattern. ← Patchwork Quilt With Paper Piecing Blocks. I have a friend who is big into quilt making, but she creates the bigger versions. Not sure whether she has ever come across mini quilts before but I will certainly pass your website on to her. Your article was detailed and informative and would obviously be very interesting to someone like my friend who is besotted with quilt making. I like how you described how to make a quilt and the art in which one can come up with a quilt Idea. My sisters and mother are more into quilt making then I am, and I believe they could find your blog very informative and useful for their quilting hobbies.